Oysters are our drug of choice. And, while we’ve never shucked one before, we’ve eaten hundreds from the East Coast, to Canada, and back to the West Coast. Yes, the tastes are quite different and, as Romy Pokorny Weinberg from Serendipity Magazine notes, it’s like drinking only one kind of wine. Blasphemy! So, in fitting with the theme of enjoying oysters, we’d like to take you to Mollusk School with Serendipity Magazine for a special, exclusive preview of their September issue out this week. Get slurping, people! Serendipity Magazine has rounded up a stellar list of the best products made right in our own backyards of Fairfield and Westchester Counties. 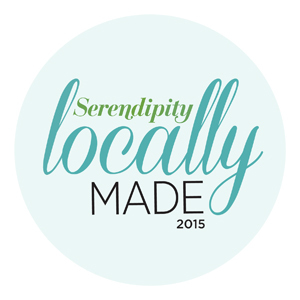 From design studios, to soaps, to bakeries, to chocolatiers, and even violins, the end result is the Serendipity Locally Made 2015 guide that show off what Fairfield and Westchester have to offer. One of the biggest highlights of the year for Fairfield County is the Greenwich Wine + Food Festival, brought to you by Serendipity Magazine. Now in its third year, this three day event marks the beginning of fall, but also celebrates the best of food and drink in Fairfield and Westchester Counties. Something else that makes the Greenwich Wine + Food Festival great is that proceeds from ticket sales go directly to The Hole in the Wall Gang Camp, a charity started by Paul Newman in 1988 that gives seriously ill children a chance at a fun and soul-healing summer camp experience. This year you can expect more food, more celebrity chefs, more wine, more beer, more drinks, and more awesomeness than ever before. All the fun starts off on Thursday, October 3 with the Kick-off Party at Miller Motors in Greenwich. Then, on Friday is the Grand Tasting Gala that we were fortunate enough to go to last year…it was excellent. We met lots of chefs, sampled some amazing food, and even had some wine. And, finally on Saturday there is the heart of the Greenwich Wine and Food Festival: culinary village, chef demo tents, lots of food and drinks, meets and greets with celebrity chefs, and a monumental burger contest hosted by Joe Bastianich and judged by an all-star panel. Here’s a breakdown of each day with prices and info. Hope to see you there fellow winos, beerocrats, cocktailers, and foodicianados!